As a composer and improvisor, Louise Fristensky (b. 1987) is deeply invested in exploring collaborative sonic spaces and discrete sound worlds. She enjoys creating lines of communication within her works through explorations of the timbral connective tissue of musical sound-space within individual instruments, instruments within ensembles, and electronic/electroacoustic spaces. 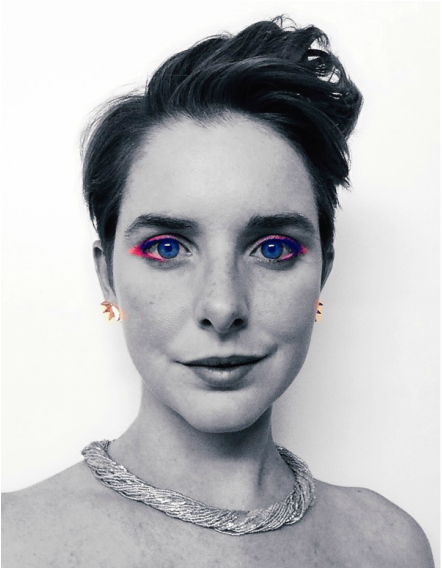 As a burgeoning visual artist, Louise is interested in exploring textural- and color-connected spaces, and the creation and curation of shared experiences. Recent and upcoming projects/commissions include a piece for Andrea Violet Lodge (piano and electronics), a piece for Brietta Granger’s Contemporary Commissions Project (percussion trio), a piece for soprano, electric guitar, and harp, a percussion trio, and a collection of fixed media scenes. Other personal projects include work on physical visual art works and digitally falsified landscapes, and the continuing development of an evening-length dramatic work. Louise has had pieces performed by pianist Cristina Altamura, bassist Joshua Lambert, saxophonist Allison Adams, soprano/composer Pamela Stein Lynde, the Nouveau Classical Project, and glass armonica & percussionist Chui Ling Tan, among others. She was a fellow and Composition TA of the nief-norf Summer Festival (nnSF17). As an improvisor she has performed/recorded with Monte Espina (Ernesto Montiel, Miguel Espinel), Quartet Fandatan (Ernesto Montiel, Miguel Espinel, Andrew Jordan Miller, Karl Roehling), Daniel Ryan, the UNT Composers Free Improvisation Group. She has also participated in and had her works performed at numerous new music events and festivals including Soundlings Festival 2018 in London, LaTex 2016, FURY: the will to be heard co-hosted by CUSP and Stone Mason Projects, and the nief-norf Summer Festival both as a fellow and as the Composition TA (2016 & 2017). Currently pursuing her PhD in Composition at the University of North Texas, Louise has studied composition with Sungji Hong, Kirsten Broberg, and Andrew May, intermedia with David Stout, and sculpture with Alicia Eggert. She pursued graduate coursework at Rutgers University in the studio of composer Steven Kemper. She holds a B.M. in Music Composition and Theory from New York University where she studied contemporary composition with Youngmi Ha. Through the nief-norf Summer Festival she has studied composition with Christopher Adler, Tonia Ko, Christopher Burns, Nina C. Young, Mark Mellits, and participated in an improvisation workshop with Tim Feeney. Previously, she studied classical voice and flute under Ron Cappon and Soo-Kyung Park, respectively, at the Manhattan School of Music Precollege Division. Louise is interested in computer programming and its applications in music. She has studied (and continues to study) Max/MSP, RTCmix, Arduino, HTML, and CSS. She has also continued to hone her cooking skills independently. Louise also enjoys visual art and literary explorations, which you will ocasionally see cropping up on this site.